But just so you know, weed will grow in anything if you take care of it. Of course we’re talking about growing inside. We don’t like pots outside above ground unless you can keep your eyes on them. It’s very difficult to keep track of watering during the summer months and they dry out so fast, one missed watering will ruin your plants. If you don’t have any restrictions about size, at this time we recommend using 5 gal fabric pots for ease of use. I use Smart Pots. The larger the pot, the more complex the root system, the thicker the stems, the bigger the buds. Yes, there are exceptions to everything but that’s what they are, exceptions and you can expect what is described herein. 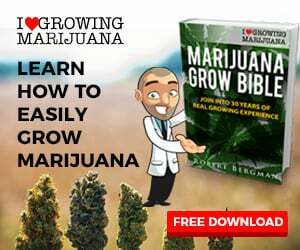 Of course there are many other factors involved; available lumens, heat, humidity, pests, nutrients, your skill etc… that can and will affect yield no matter what size pot you use. We are using plastic pots as a container and now using fabric pots inside them; except for seedlings and truth be told, fabric is like the magic nutrient snake oil salesmen have been fooling people with for years (no such thing-your plants only need certain nutrients and can take only so much). Check out 5 gallon fabric grow pots for yourself; you’ll notice a difference in your plants. 2 replies to "What Size Pot Is Best To Grow Pot"
Thank you for sharing the best pot size to grow the best pot. a very informative article. Worth sharing and reading.